Caroline the Lake Murray Mermaid is a lovely mermaid working out of Lake Murray Shores, South Carolina. I spoke with her a couple months ago… and just last week she got a job swimming at Ripley’s Aquarium in Myrtle Beach for the summer, every day at 12, 4 and 8, and so you should obviously go there immediately to see her. If you are very lucky, I might post a follow-up interview with her to see what it’s like, swimming with stingrays and sharks and other gorgeously terrifying creatures, in a huge glass tank. 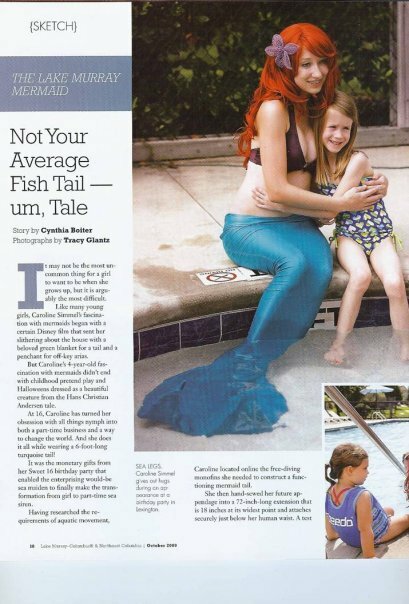 In the meantime, you can visit her youtube channel for some mermaidly videos, after reading our delectable, yet slightly out-of-date, Q and A.
I have been a mermaid for two years now, but if you ask anyone in my family they’d tell you that I’ve always been a mermaid at heart. Ever since I was a child, I’ve loved the ocean and all it’s inhabitants. I was first introduced to mermaids when I saw Disney’s The Little Mermaid and from then on, I was hooked. Mermaids completely captured my imagination and strengthened my love all things aquatic. Whenever I went swimming, I’d pretend is was a mermaid and swim dolphin-kick style. In my later years, I found that I could swim faster when I swam that way. As a kid, I would wrap a long blanket around my legs, put on a belt so it stayed at my waist and tie the bottom to look like a mermaid’s fin, and crawl around the house in my ‘tail’ hahaha 🙂 So pretty much, I’ve been been a mermaid my whole life. What is the appeal of mermaids—and mermaiding—to you? Oh gosh, everything! Hahaha 🙂 When I first learned of mermaids, I fell in love with their entity. They’re the most magical and wonderful mythological creatures and I just can’t imagine our world without the impact of their stories. They are the bridge between humans and the aquatic world that covers the majority of Earth. I’m so jealous that they can swim along the most unique and powerful creatures on this planet all day long. I swear, if I had a set of gills, I’d be underwater 24/7! Being able to ‘be’ a mermaid has brought me the most joy I’ve ever experienced. 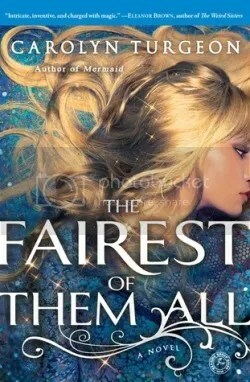 What is it like, working as a mermaid? Can you tell me about some of the events you’ve done? It is THE most satisfying job I could have ever fathomed. I can’t express to you in words the way if feels when a child’s face lights up at seeing a real live mermaid, and getting to talk to her and swim with her. It’s simply incredible. Right now, all I’ve done are private kid’s parties, but I’m not complaining. I get to play mermaid games with the kids (like Fish, Fish, Mermaid and Diving for Treasure), and I crown the birthday girl with a handmade tiara of seashells making her an honorary mermaid. I’m working on making an appearance in the fountain in front of my local movie theater for the premier of the new Pirates of the Caribbean movie, plus I’ve already been booked for two private parties in June and I’m planning a graduation trip to Jamaica for a week. How has mermaiding affected your regular life? It’s changed it completely (for the better though). At first, some of my ‘closest’ friends ridiculed me and stopped talking to me completely because they thought I was a nut. My real friends, however, stayed by my side and really supported me, especially when the news spread to the rest of the school. I was teased, taunted, all of the above, but I never let it get to me. The torments by my fellow students did dwindle though and people started to encourage me. The school newspaper did an article on me and I even got my own page in that year’s yearbook! It was pretty exciting for me. Today, I still get the occasional insult at school and on YouTube the hateful comments never cease, but like I said I haven’t ever let that slow me down. If anything, being a mermaid has raised my self-esteem to a level I had never had before. I’m not saying it’s made me cocky, just that I’m much more able to stand up for myself in a tasteful way and I don’t let what other people say/do bring me down, which is something that I’ve struggled to achieve my whole life. How do people respond to you when you’re in your tail? In a couple of different ways. Mostly, it’s your typical “Omg, there’s a mermaid!” that I get from the kids and at lot more adults then you would think, which I LOVE. I love giving that mystical moment to them. Occasionally while I’m at the local pool I get a “Where did you get that tail?” from the older kids and teens who know it’s not real. 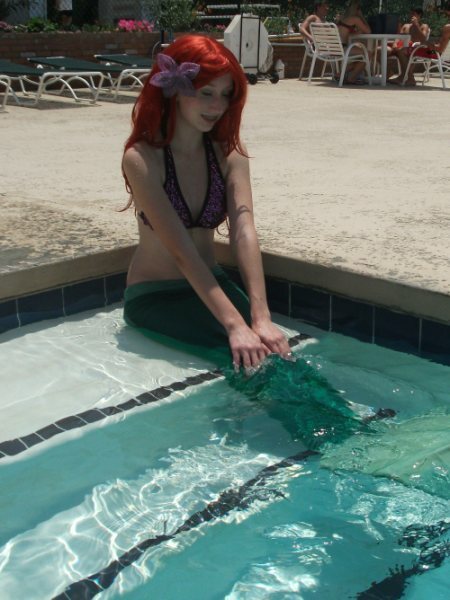 If there aren’t any little children around, I tell them about the How to make a swimmable mermaid tail video by Sasha and about Mermagica.com. Then on very rare occasions, I get a hater who thinks it’s fun to ruin the magic for the little kids. I’ve only had it happen once and I was able to convince the kids that he was in denial, but it was close. I’ll never be able to understand why some people feel the need to take that magical moment away from children. It just baffles me. 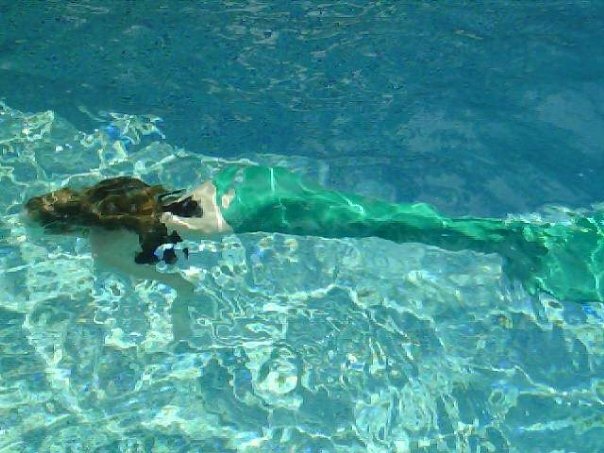 I understand you appear as the little mermaid and as the tropical mermaid. Can you tell me about these two characters? Yes 🙂 The Little Mermaid is obviously based off Disney’s Ariel. That’s my big kids party character and I love it. I’ll sing them a song or two from the movie and do my best to mimic her bubbly personality. The Tropical Mermaid, on the other fin (hahaha), is my mermaid persona. She’s got a very positive outlook, is quite energetic, loves to talk to children and teach them all about her world, and is a little flirtatious when she’s not around kids. She also loves to raise awareness about what humans are doing that hurt her and her friends in the water. She wants to teach children how to care for the oceans, lakes, and rivers so that they’ll still be there for centuries to come. Where is Lake Murray? What does it mean to you to be the Lake Murray Mermaid? 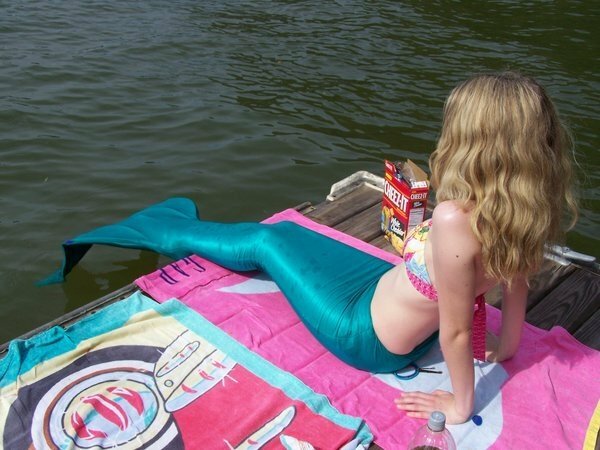 Are lake mermaids different from ocean ones? I know you have some mixed feelings about mermaids’ growing popularity. Can you talk about this? It’s complicated. I love that mermaid’s are growing in popularity because one: it’s great for business, two: its a great for true aspiring mermaids/mermen who have been afraid to dawn a tail, and three: it’s a great way to raise awareness about our fragile water systems. The only thing that unnerves me is that I think people will start becoming mermaids just because it’s popular, which will drown out the true mermaids who actually care about the responsibilities a mermaid has. One thing I can’t stand are people who do something or say something just because its cool and not because it truly expresses themselves. It just bothers a part of me deep down inside and it’s sad. They should go after they truly care about, not ‘what’s hot’ at the time. What message are mermaids trying to send to the rest of us? Quite a few I’d say. One of the main ones are that people need to start realizing what their doing/what damage has already been done to the oceans, lakes and rivers. Did you know that everyday things like fertilizers for your lawn can harm aquatic ecosystems near you? After rain, the chemicals in the fertilizers combine with the water and runoff into the waterways. When it makes its was into a river, lake, pond, etc., it can cause eutrophication (the formation of algae blooms) that literally suffocate and destroy the ecosystem by sucking up all the oxygen in the water. Not cool. I think that mermaids are also trying to say that you should be true to yourself. 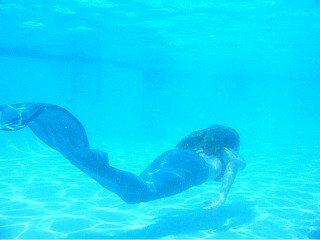 Being a mermaid isn’t for everyone,but neither is being a doctor or a pilot or a construction worker. Do something with your life that you love doing and that will further individualize you as a person. I strongly believe that if every person did that, the world would be a better place. Not to mention, people would be so much happier with the life they were living! It’s so sad that people are put down for expressing themselves if it’s not considered ‘normal’. I know that if you do what you love anyway, everything other people say just won’t have an effect on you. I just found your blog and I love it!! 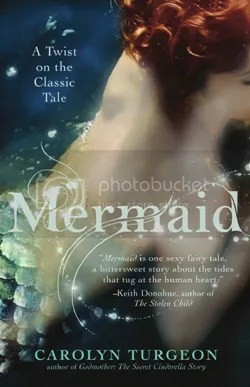 I love mermaids, it’s so inspiring to read about real-life mermaids and other people who love them. Thank you for this post! I visited Myrtle Beach this past weekend, and it was because of this that I knew about the mermaid shows. (Well, there were also billboards everywhere, so I would have found out about it anyway, but still.) I got to see it! It was great!